On Saturday afternoon I was patrolling the south side of Black Rock City. I was walking down Village Way when I heard, over the radio, warnings of high wind. I pulled dust goggles over my eyes and a bandana over my mouth; now I would be able to see and breathe in spite of the dust. I continued away from center camp, making it to within a block or two of the city's southern boundary before all visibility was cut off. Folks darted to and fro, trying to find shelter from the onslaught of dust. I had just visited with a nice couple who misted passers-by, and so the dust stuck onto parts of my skin that were still wet. A few moments later I was at the edge of camp, looking out at a clear playa. Only the playa surface that had been disturbed (by cars or frequent foot traffic) became dusty when the wind flew over it; everything else stayed in place. I was able to take away my bandana and normally breathe. As the dust storm raged on I continued my patrol, visiting each of the structures on the playa, speaking with the citizens of the city that were stranded for the time being. Most were in very good cheer, happy to be out of the dust's way. 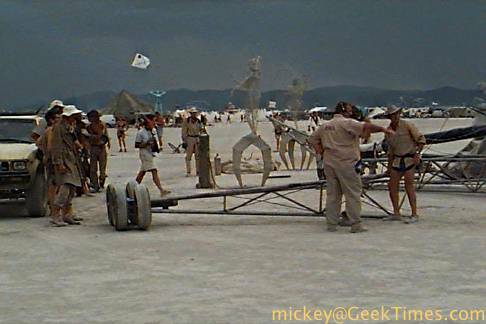 From dispatch I heard reports of a person being run over on the playa. 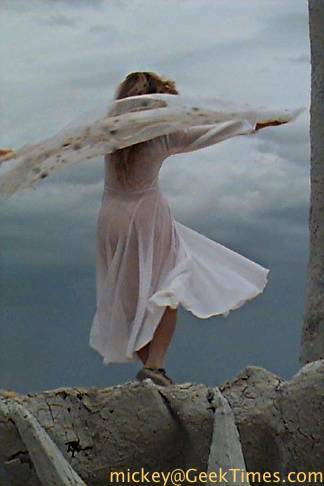 I turned towards the Temple of Rudra, where Pepe's opera was to be held that evening. From afar I took this picture of the temple's four towers and, strangely out of place, something that crossed them at an angle. I checked my medical kit and started off toward the accident area. 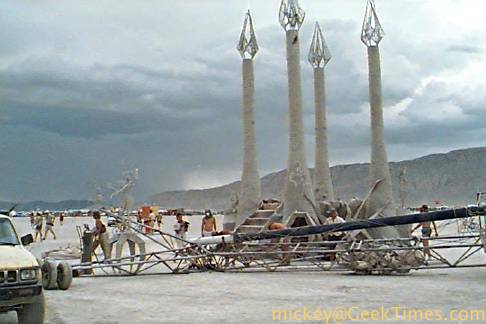 As I got closer I saw what appeared to be a crash scene between the temple and something with a very tall mast. The wind was blowing, and inbetween whiteouts and moments of clear blue sky I saw people in small clusters around the area. Early on the scene was another photgrapher. 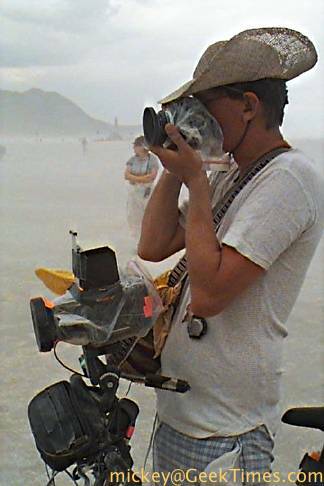 In contrast to my budget digital camera, he was outfitted with a Hasselblad on a tripod and a 35mm single-lens reflex camera, both protected from the invasive dust by bags of plastic. 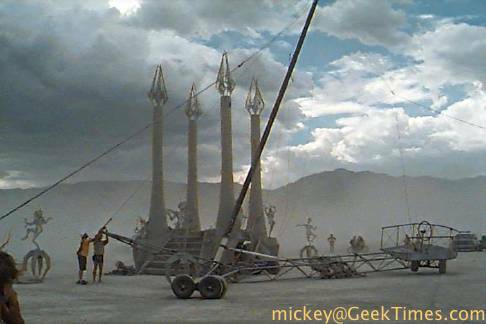 I turned from the photographer to the accident scene, I was stunned to see that the mast belonged to a huge, heavy, metal playa boat. Some if its tires were off the ground, the body jammed into the towers. 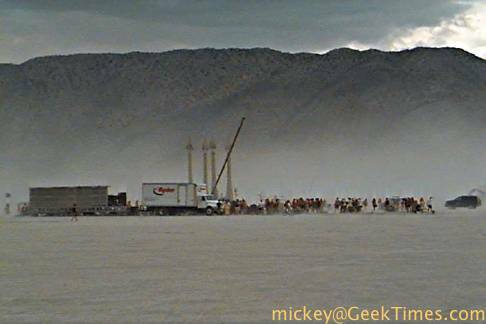 People started coming to the area from all over (although the dust storm was keeping most of them hunkered down). 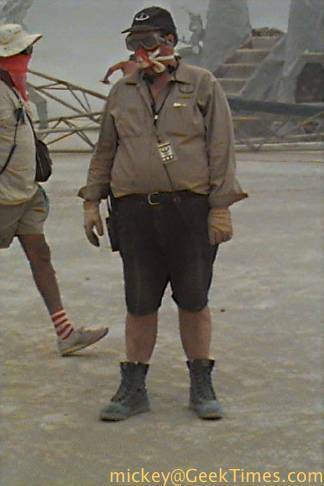 Outfitted with a gas mask body, early on the scene, was Ranger Damon (also of the Otaku Patrol Group). 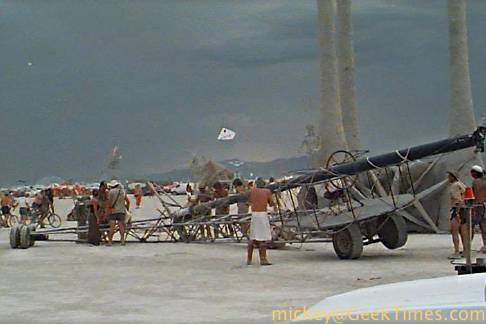 Damon worked the crowd, keeping them away from the teetering sail craft. My first thought was to prevent it from falling on a bystander when whatever was stuck finally gave way. 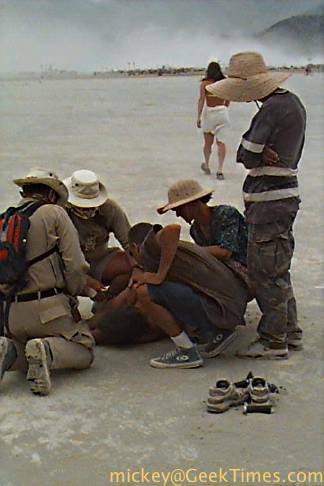 A Ranger medical team tended to a very drunk individual lying on the playa. He was being rather belligerent, trying to convince the medics that he just wanted to walk away. He didn't look capable of getting to his feet. At the center of the maelstrom stood Ranger Big Bear, the scene commander (if memory serves). I think he's in conversation with Ranger Death Valley Kelley. By this time there were also Ranger teams doing crowd control on all four sides of the temple. Fighter pilots say that the hardest thing about air battle is finding and joining it (from very high speeds). 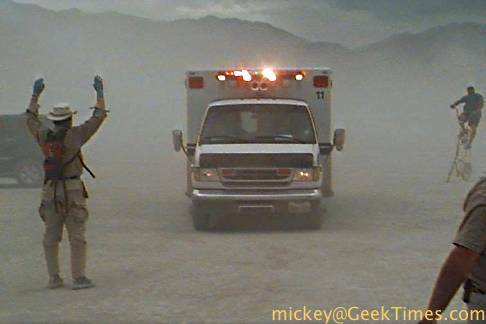 From my emergency medical technician (EMT) days I can vouch for the difficulty in finding an accident scene in a busy world (like a playa littered with artwork in the midst of a duststorm). Once we know that a Regional Emergency Medical Services Authority (REMSA) rig was on its way, we all kept an eye out for its lights. 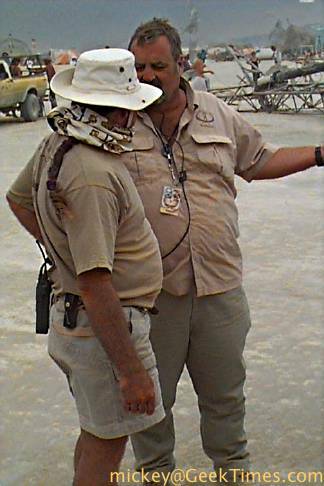 A Ranger on bicycle intercepted the rig on the playa and directed it to this Ranger, who is guiding it to the downed patient you saw earlier. The immediate concern to life having been dealt with, our attentions turn to the next danger, the vehicle and the structure that collided. I was hoping that the sparks from the welder would be visible in this picture, but sadly they're not. A team of Rangers and Black Rock Department of Public Works (DPW) staff are taking apart the vehicle, trying to safely move it down and away from the temple. A conference of Ranger officers is had around one of the vehicle's struts, which was just cut away. A decision. 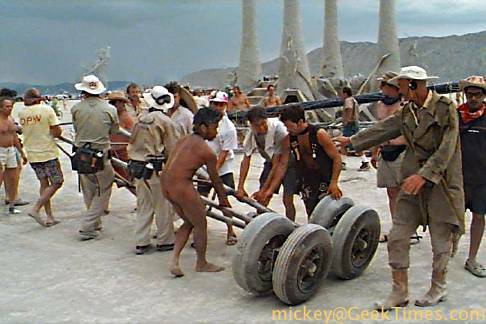 Rangers and volunteers from the crowd are directed to wheel the very heavy strut away from the rest of the work going on. (Several more parts were removed before the hull could be towed away.) At the right front you see Danger Ranger - the head of our thin tan line - in his trademark boots and floppy jacket. 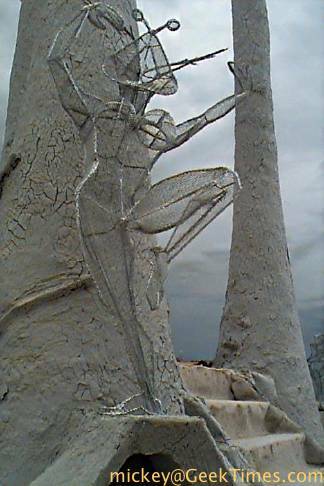 There was much delicate sculpture on the temple that was narrowly missed by the crash. 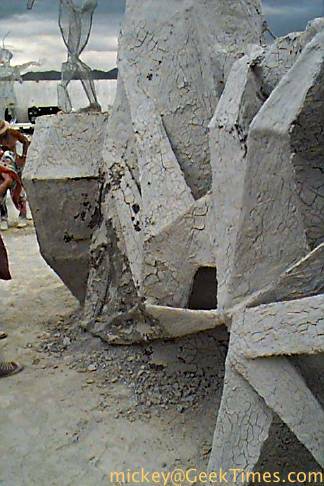 Although the vehicle was heavy, and under great speed, the visible damage to the temple appeared to be minor. Inspections happened, and Pepe's opera was given the permission to proceed that evening. 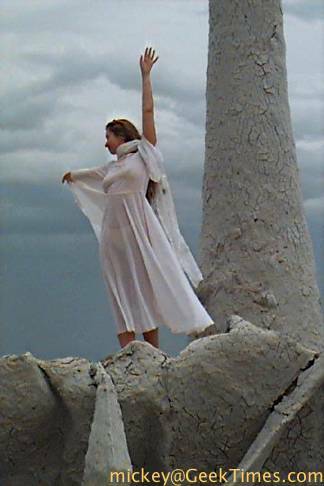 As we left an opera dancer took to the stage, celebrating the continuation of Burning Man and the coming of the opera. 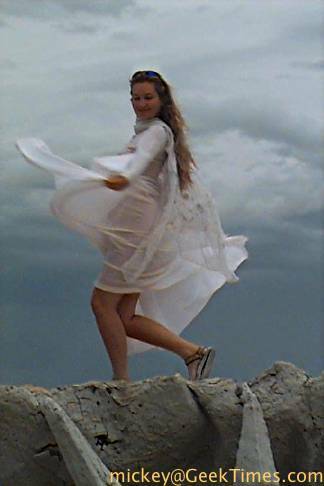 But then the rain hit. My day turns into night.